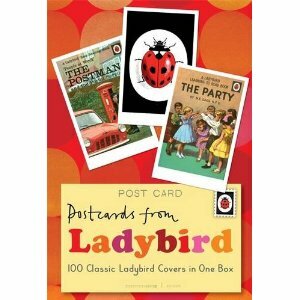 Did you see those packs of vintage Ladybird postcards that were on sale around Christmas? I was, of course, tempted by them but then the obvious question was ‘Why?’. I mean, what do you do with a box of Ladybird postcards? Well here’s an answer. Why did I never think of it? It came in an email I received this week from a Ladybird-loving friend. We had a jolly Ladybirdy Christmas, especially on Boxing Day at my sister’s. I’d given her the Box of 100 Ladybird Postcards (yet another spin-off, postcard sized reproductions of the covers) and her lot decided they were going to play Charades with them, as in: take a card, hide it, mime the title to the rest of the party, they have to guess it. High point was my 27 year old nephew, 6’5″, being ‘Bunnikins Picnic Party’; low point was me getting landed with ‘The Public Services: Gas’. I will leave it to your imagination – wine had been taken. (Maybe a new feature of your website could be suggestions for party games that can be played with Ladybirds, the ruder the better?) They didn’t guess my ‘Come to Holland’ which was very disappointing, I thought the windmill, and little-boy-with-finger-in-the-dyke mimes were excellent. So there you go? New section for my website? Any more such inspired party-game suggestions?